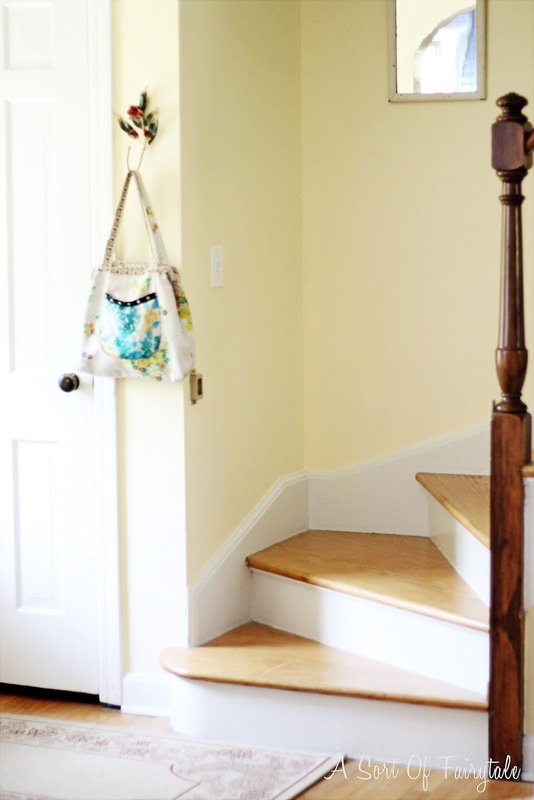 Last Saturday we had the entry, stairway, and upstairs halls painted in a most lovely pale yellow, "Frosted Lemon" by Behr. I LOVE how it turned out! I was not totally sure about the yellow at first, but in the end, I am so glad I chose it. One thing I am sure about is how awesome it is when someone else does the painting for a change! This is a new table I bought (no, I didn't paint that masterpiece) on One King's Lane. It was originally purchased for my bedroom, as a night stand, but I decided it was too pretty to have tucked away in a corner in there. 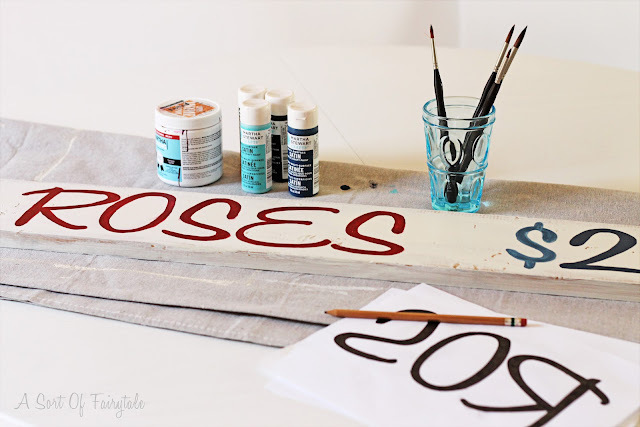 In this post I mentioned I was working on a vintage inspired, painted sign...well, here it is! 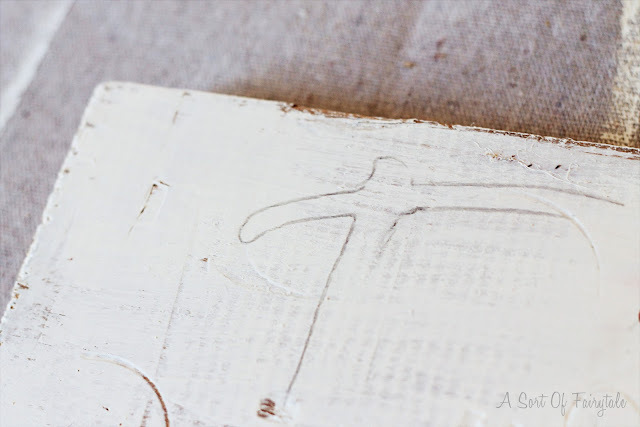 I used a very "old school" way of transferring the font onto the wood in pencil, which I then hand painted over. More details on the sign creation at end of post. This is the opposite view into the living room from the entry hall. 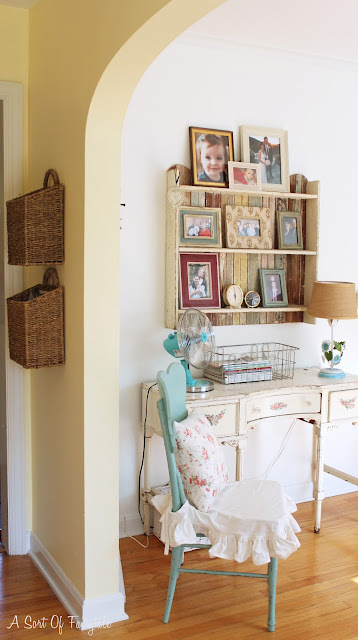 The baskets on the wall are also new and corral all the mail, they were $10 ea. from World Market. 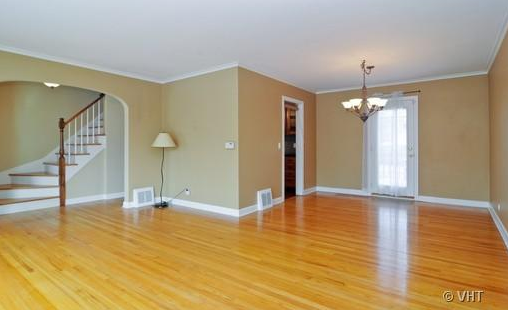 Check out this photo of the entry hall, living and dining area of our house when we first bought it...empty and blah! The color was actually worse in person. I painted the living and dining areas in an off white called, "Toasted Marshmallow", also by Behr and I think it goes quite nicely with the new "Frosted Lemon". My house sounds like one delicious treat!! I found a piece of wood in my basement that was suitable for the sign to be, which I painted in one quick, rough coat of interior house paint I had left over. Then I created and printed out my flipped image text on regular 8.5 x 11 paper as shown in the picture below. I used Photoshop to make the text, but any word processing program will do. I used a regular pencil to "color" in the letters. Then, I flipped the page over, eyeballed placement of words and traced the letters. This process, which I am sure many of you have done or know how do, transfers the text onto the wood. Hope you enjoy the rest of the week and I'll be back soon with more Cottage Style and Color in my living room! it is so full of cheer. and yes it does sound like a tasty treat. Sounds and looks like your home is ready for summer. gorgeous gorgeous! looking forward to the living area! How lovely! And the table and Kidston bag were made for each other! Gorgeous post! Am loving the table in the entrance - so so pretty! The yellow is the perfect color, and yellow is hard to get right. 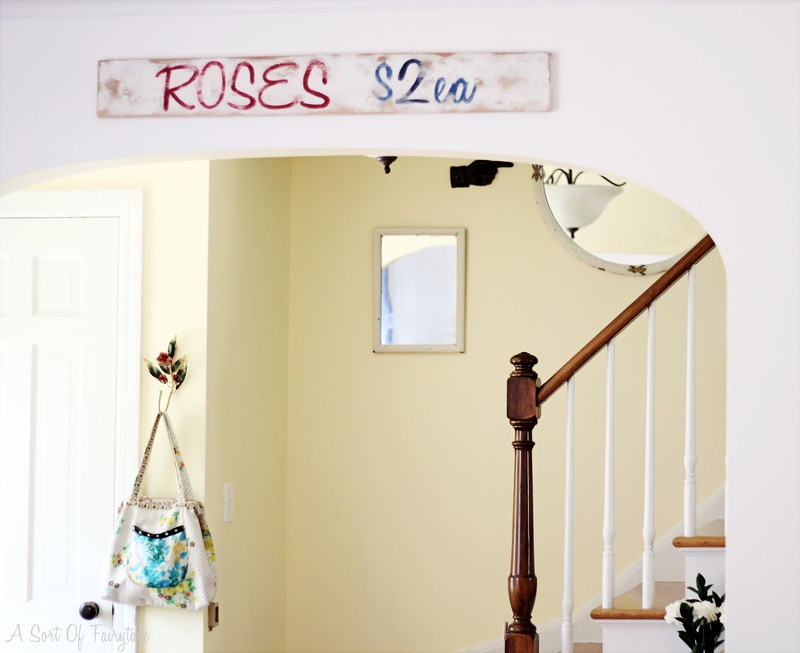 Everything roses, is just darling, and what a cute sign. Love every photos!! I love your new paint color and the sign turned out great. 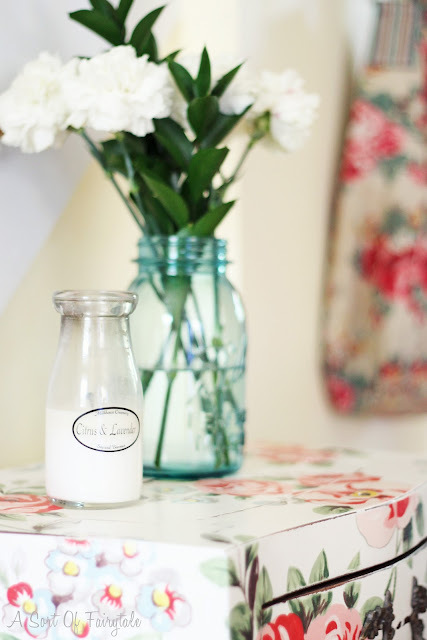 The table is so cottagey and pretty where you've placed it. Love your little floral table! The sign is super cute, too! your home is such a happy place. i just love it! i love that color stacey. that could be the color i have been waiting for for my bedroom. so pretty. your home is so lovely!!! As soon as I saw your new table I thought of Cath Kidson. It is really pretty! Lovin' your new sign too! You did a great job! You have such wonderful style. I look forward to seeing more! It all looks so amazing Stacey! Such a perfect soft shade of yellow. I'm really loving your desk and aqua chair ~ sooo pretty. Can't wait to see more!! I first read this post in a coffee shop this morning and totally squealed out loud when I saw all the photos, Stacey! People totally gave me weird looks. 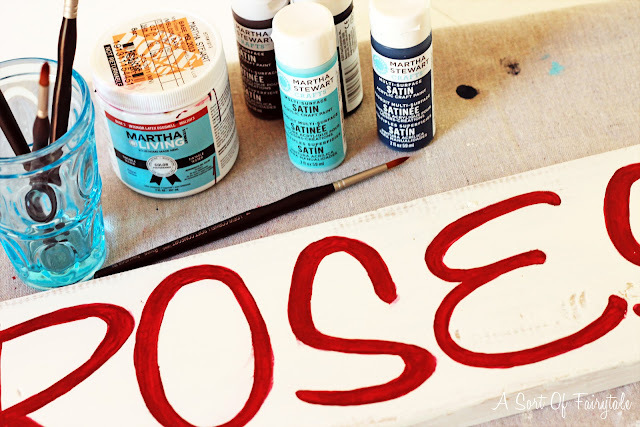 :) Great wall color, LOVE that table and how it does seem to match your CK bag, the sign is adorable, and I'm <3'ing all the fun pops of aqua! I *seriously* can't wait to see more of the living room reveal! i love love love this post. your house is so full of charm and is indeed a tasty treat! if you decide to sell your signs, i will buy one! thanks for all the inspiration tonight! I adore your cutie pie house! Love the table and especially the sign. I just love all the new colors and so many details. So pretty! What a great tutorial. I bet you will be making lot's of signs! I would like to try this! love the table, love the sign! I was going to email you the picture but your email button on your blog didn't work. That is so weird...I was going to paint my living room a soft yellow, and now you've given me the exact color to use! Thanks. I love yours. It's so pretty and light. I love the sign too. I'm "stealing" your idea. I love, Love, LOVE the changes you've made!!! Did I already say how much I love it all?!?! lol You talented lady, you!!! :) Love the sign too!!! Can't wait to see all the posts that I've missed - this whole "school thing" is keeping me uber busy these days!!! 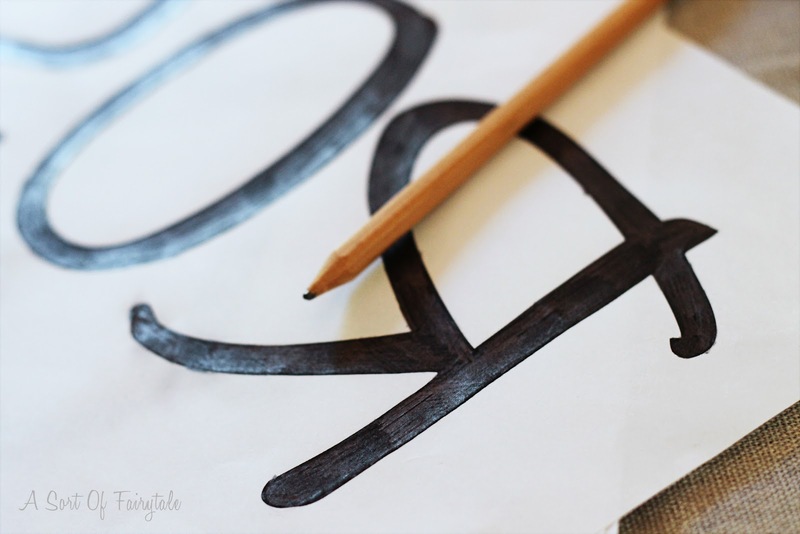 Feel like I've missed so much of my fave blogs (like yours)! :) And I'm glad you were able to relax a bit this time around by having someone else paint - painting can be so tedious, I know!!! lol Wishing you a fab rest of the weekend! Love the yellow (gotta love the paint color names!) and that floral chest is fabulous (does look like your bag)! 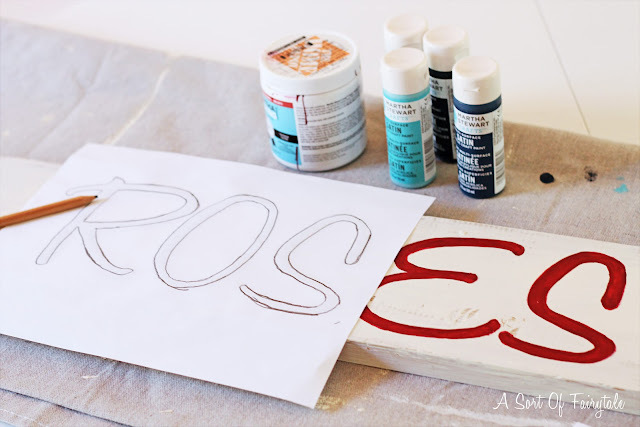 Thanks for going old school on the sign - sometimes, these tutorials make me want to run screaming! Can't wait to see more of the living room! I found you on cowgirl UP! Your home is so pretty -- beautiful color you chose. Mostly I love that little floral table. 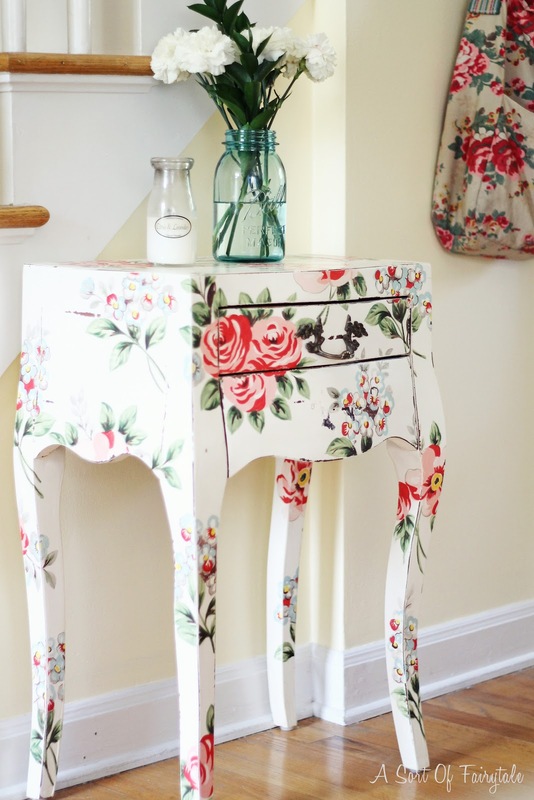 I kept trying to decide if is decoupage, but you say it is painted. Whatever, it is so beautiful! So fresh and clean!! I love it. The photography and styling is spot on too! Great job. 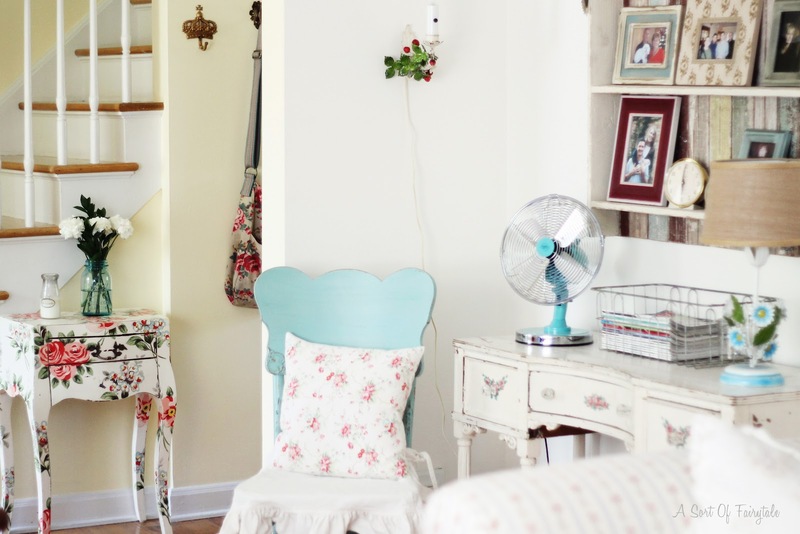 adorable floral table and bag, stacey:) i love your cute desk area, esp. the blue chair with its ruffled slip! I love the light blue in the chairs and the pillow. Did you paint that chair yourself?